After you've been breastfeeding for six weeks, you and your baby have probably settled into a nursing routine that's comfortable for you both. You are likely seeing your baby's first smiles, and you might even catch him smiling while on the breast. Your happy breastfed baby might even be sleeping long stretches at night, which can be worrisome after spending the first month and a half of his life ensuring that he was awake often enough to nurse a few times each night. Fortunately, by this point, most babies are fine with a little extra sleep and fewer night feedings. By the time your baby reaches 6 weeks of age, she is starting to be able to tell the difference between day and night. Plus, unlike in the newborn period, your 6-week-old breastfed baby can sleep a little longer without waking. As long as her weight gain is fine, you don't need to wake her up for a feeding in the middle of the night anymore. On nights when she spends more time asleep and less time nursing, she will probably make up for it by nursing more the next day. If your baby has started to lose weight or is gaining weight slowly, you might need to wake him up a few times at night to feed. This is especially important if your milk supply didn't get off to a good start because frequent stimulation is necessary to build up supply. If you need to wake your baby for a feeding, start gently. Watch your baby for signs that she is in REM sleep instead of deep sleep. In REM sleep, the baby flutters her eyelids, smiles in her sleep and clenches her fists. Gently stroke the soles of her feet and her palms to try to wake her. If she resists waking, remove her shirt and gently prop her upright against your bare chest to provide skin-to-skin contact. If you cannot wake her at all, she could be in deep sleep. Let her rest a while longer and try again when she seems more active. 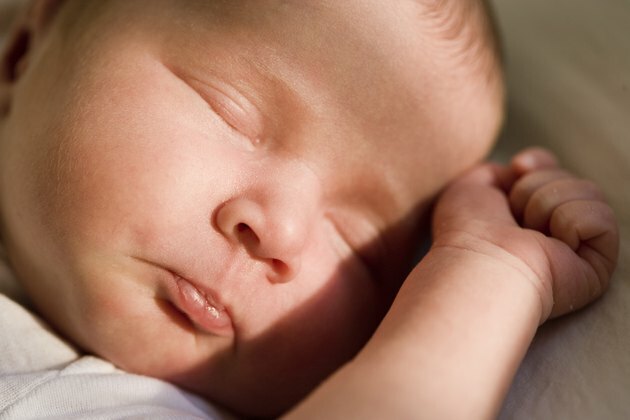 Even if your baby is sleeping for six or seven hours at 6 weeks of age, this might not last forever. Many babies enter a growth spurt around 6 weeks old and start waking more frequently to nurse. Changes in sleeping patterns at this age are completely normal, so as long as your baby is growing well, there is no need for concern about how long he sleeps.